Light Tanks and Heavily Armed Vehicles is part of the Armored Fighting Vehicle series. These vehicles, widespread throughout the world, can be used to accomplish a number of different missions. They are simple to use and are extremely versatile. This book brings together, for the first time, all light tanks and heavy weapons vehicles, with chains or wheels, from the world over and their many modernisations and modifications, along with the technical characteristics of each and every model. Enriched with more than 350 photos, and a clear and methodic layout, it reveals the history of each vehicle along with precise dates and a time-table showing when they were put into service. Dimensions are indicated in a practical and visual manner. 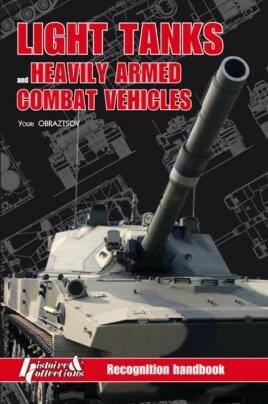 This handbook allows the reader to precisely identify a light tank and a heavily armed combat vehicle from an image, or even a partial image. A series of four tests will allow you to evaluate your current level and improve your knowledge on the matter. Bringing together all these qualities, this manual is an indispensable tool for the armed forces and everyone that has a passion for armored vehicles and military history. The book was created by a specialist in the field of identification, in collaboration with manufacturers and armed forces. It is the fourth volume in a series of books on military material, the first volumes of which are entitled "Main Battle Tanks", "Infantry Fighting Vehicles”, and "Wheeled 8 x 8 Armored Fighting Vehicles”.